*Ticket discount available for Chefs Collaborative Members! 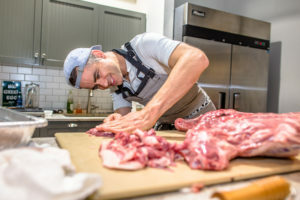 In this workshop tailored for professional cooks, leading advocate for sustainable butchery Adam Danforth will discuss the virtues of older animals, how working muscles render more flavor, the inverse relationship of taste and texture, and why we should be supporting farmers more by consuming their older and cull animals. The workshop will include a rundown of meat science and how we experience it as deliciousness, all the while breaking down an older animal into primals and cuts. Adam will answer questions along the way and relate the animal’s anatomy to that of other farmyard species. Blind tastings will provide insight into the underlying science of muscle function, texture, and flavor. Click through to the ticket page for more information.